It is said that a statue of the God of Medicine carved from fossilized hot spring mineral deposits has a hot spring gushing from its breast. 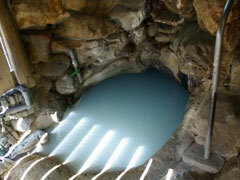 This is a well-known urn-shaped hot spring in which Oguri Hangan is said to have been healed. 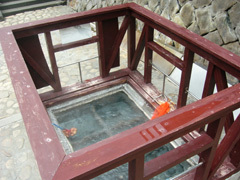 This is a pool of hot springs which is used for hard boiling eggs and regional vegetables with natural water temperatures of about 90 degrees Celsius in a naturally occurring hot spring. 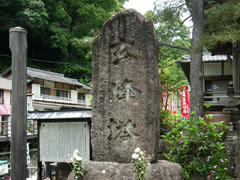 A stone monument dedicated to Genpoh Yamamoto who was a priest. While alive, he came every year and stayed at the Azumaya Inn of the time. The spiritual leader, after undertaking rigorous ascetic training as the chief priest of the Rinzai sect of Buddhism, wrote the treatise “The Emperor as a Symbolic Head of the Country” which became adopted into the modern constitution. 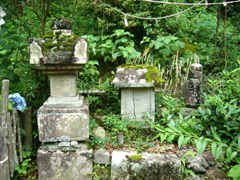 This is the site of the ruins near Yu-no-mine Oji along the historical route of the Kumano Kodo. Long ago, this area was built up with a line of an oji shrine, Yakushi-ji Temple, and a 2-story pagoda as a place of hard mineral deposits from hot springs, but all were lost in a ferocious fire in May in year 36 of the Meiji era (1903). 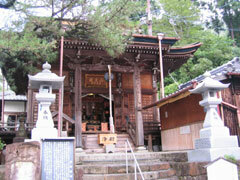 Later, upon rebuilding, the hot springs gushed forth from the rebuilt Yakushi-ji Temple’s highest ranking Buddha statue. From that time, the name “Yu-no-mune” (hot springs from the breast) was corrupted to “Yu-no-mine” (hot springs in the peaks). 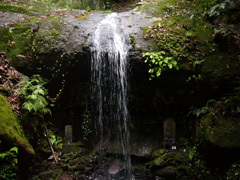 Oh-ato-no-sukune is the person who governed the Kumano areas and discovered Yu-no-mine Hot springs. These falls were used in ascetic religious ceremonies by Saint Ragyo in a naked state under the falls. 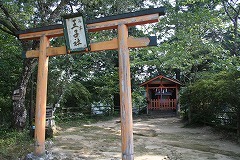 This tells the legend of Saint Ippen, who scratched out his ardent wishes with his fingernails on the origins of religion which was carried out for one hundred days at Kumano Hongu Taisha Grand Shrine. 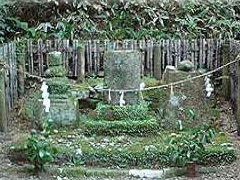 The burial mound of the cart on which the princess, Terute-hime pulled Oguri Hangan to the waters of Yu-no-mine Hot springs. Every year, there is a harvest here at the site where rice was first harvested after the straws tangled in Oguri Hangan’s hair were discarded while Oguri Hangan was healing. 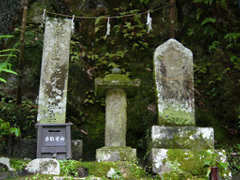 While Oguri Hangan was healing, these were the stones on which he lifted to test his strength.